Select belt for the nearest approximate shaft setting. 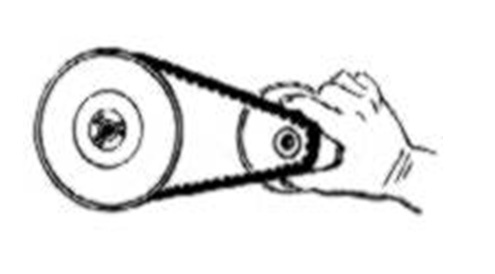 The belt should be at its’ highest point in the driven pulley flanges. Remove the outer half of the driver clutch. Squeeze the belt down and pull it forward as shown. Position the engine so that 1/8" to 3/16" of clearance is provided around the clutch bushing/hub.